Artists are often required to provide the dimensions of an original painting, and that's easy -- just measure it! Yet, when the piece has been framed, do you include the frame in the size as well? In general, you will stick with the painting itself. There are many circumstances, however, in which you will also want to include the finished size with the frame. The convention is that the size given for a piece of art is that of the actual painting (unless specified otherwise). The first measurement is the horizontal width, and the second is the vertical height. Sometimes there's a third measurement, which is the depth of the canvas and this is usually only given if it's particularly deep. This 'rule' applies to jury submissions, gallery exhibitions, catalog listings, and your website or other online venues. If you're selling the paintings framed, there's no reason you shouldn't provide both the image size and the framed size. Many potential buyers will welcome the information. 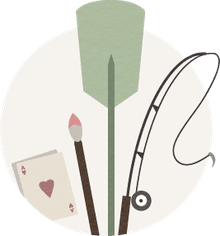 This is particularly helpful when listing your paintings for sale in an online venue such as your website, Etsy, or another seller's marketplace. It gives the art buyer a better idea of exactly what size the finished piece of art is, and they can compare it to space they have available on the wall. You need to remember that the online art market is very competitive. The more details you can give about the piece you're selling, the easier it is for buyers to make decisions. You need to give them the information that puts this 'virtual' piece of art into a 'reality' that they can relate to. Do You Show Framed or Unframed Art? When showing your work online or in any long-distance environment, you need to 'sell' the painting through the photographs. This can be a challenge for many artists, but it's required. You need to either develop the skills to do so yourself or hire a professional photographer to do it for you. For juries and other art submissions, it is general practice to only show the piece of art itself. Leave out any matting and framing as the jurors do not want to see this. They want to see style, technique, and that you're a great painter, not how it's displayed (unless it's absolutely crucial to the piece). For online retail sales, it's often best if you show the unframed close up of the art as well as its final presentation. Many artists have great success using multiple photographs in a single listing, showing the painting from different perspectives. You might also consider including a more 'environmental' photograph. For instance, hang the painting on a clean wall and photograph it from an angle. Place large paintings over a sofa in a room with nice decor, so the buyer has a sense of scale. Lean smaller paintings against the wall and on top of a wood bureau. Only add props if they do not distract from the painting. Before you list your paintings online, do some searching to see how other artists have photographed and displayed their work. There are some fantastic examples available that are easy to duplicate if you take the time. A great series of photographs can really help out your online sales. Would You Sell More Paintings If You Used One Size?